I was browsing the Forever 21 website the other day and I found this adorable dress for $27.80. The best thing about this dress is how it can transition from fall to winter to spring to summer. In the fall you can wear it with patterned tights, layered jewelry and flats. In the winter you can throw on a sweater, tights, and riding boots and look super cute. 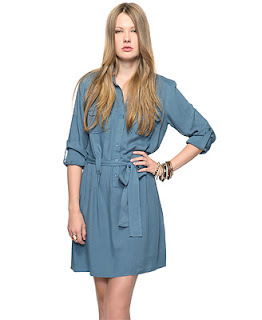 In the spring you can wear this dress with wedge espadrilles and earthy jewelry. In the summer you can wear this dress as a cover up or just with some cute sandals. So what do you think of this dress?